Compared to 15 programs in the state, Colby-Sawyer's undergraduate program led with a score of 98.85. 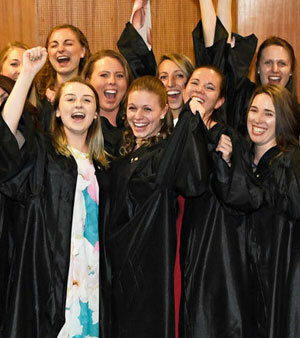 In 2018, for the third year in a row, 100% of Colby-Sawyer’s undergraduate nursing class passed the NCLEX-RN on their first attempt. Colby-Sawyer is home to one of the state’s most distinctive, top-performing undergraduate nursing programs. If you care about the health and wellness of others, are passionate about math and science, enjoy working as part of a team, and are flexible and self-motivated, Colby-Sawyer’s immersive nursing program is the right place for you. A bachelor of science with a major in nursing from Colby-Sawyer combines clinical work at the world-class Dartmouth-Hitchcock Medical Center with hands-on learning in campus classrooms and laboratories, as well as individual and group research. It's a comprehensive program that balances nursing education with your interests in subject areas across the liberal arts and sciences. It's where you’ll develop close relationships with expert faculty in small classes and be more than just a number. And, as a Colby-Sawyer nursing student, you are encouraged to be a leader not just in the classroom but across campus – go ahead and join that athletic team, club or organization and enjoy all the benefits of a vibrant, close-knit community. Colby-Sawyer’s rigorous nursing curriculum is rich in math and science. Entering students are required to have a minimum 3.3 GPA and three years of college-prep math and laboratory-based science. When you study nursing at Colby-Sawyer, you not only gain the practical skills, knowledge and experience necessary to deliver the highest quality of care, you will also graduate with a well-rounded college experience that helps you connect on multiple levels with colleagues, patients and their families. For more than 30 years, Colby-Sawyer’s nursing program has been recognized for its quality, integrity and high standards by state and national accreditation agencies. Hands-on training begins in Colby-Sawyer’s nursing classrooms and laboratories where you will apply your knowledge in simulated, state-of-the art hospital and outpatient clinic rooms.